MOM, MONEY AND MANSION—Robert T.
Robert, a man with a serious mental illness, sent Tamms Year Ten a photo of his mother, who had died the previous year. Because he had no family and no visitors, he was hopeless and desolate. 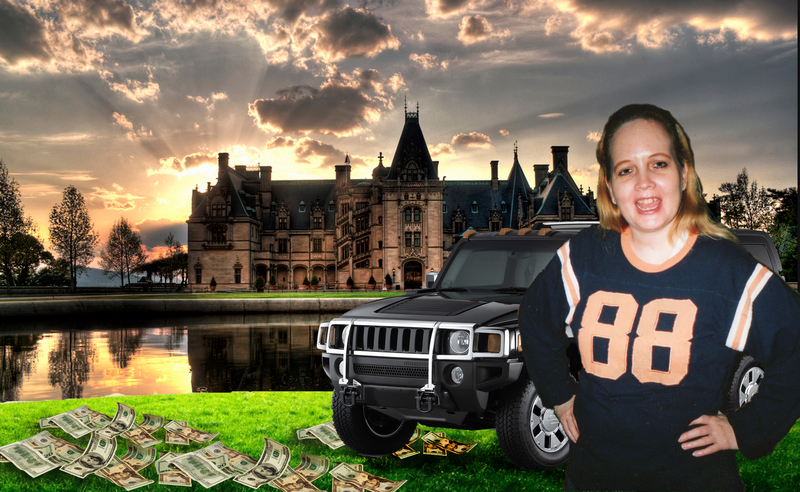 He asked for an image of “my mother standing in front of a mansion, or Big Castle, with a bunch of money on the ground. OR if you can’t do that, THEN a substitution is a big mansion or castle with a bunch of money in front of it and a black hummer parked in front of it. I truly appreciate this a lot… Now I know somebody out there in the world cares about us in here.” Photo by Jeanine Oleson, 2013.